The new Sierra Denali will feature all the luxury one would expect and the strongest V8 in the marketplace. The all-new 20145 GNC Sierra Denali will be the top of the GMC truck line when it is launched later this year. Rugged trucks with the luxury features of a businessman’s sedan are a staple of the US automotive marketplace. Luxury in a pickup truck starts with power and the new Denali will have more power and torque than any other V8 truck for sale in the US. The 2014 Sierra Denali can come with the optional 6.2 liter EcoTec3 V8 engine. With 420 horsepower and 450 ft-lb of torque this engine will rival the new Corvette Stingray engine for performance. In fact, it shares a lot with that engine including its torque rating and displacement. Using variable valve timing, direct injection and active fuel management (variable cylinder deactivation) the engine is modern and powerful, while retaining its cylinder bore, two valves per cylinder, and pushrod design that has been a mainstay of the GM V8 for over half a century. The base engine in the Sierra Denali will be the slightly smaller displacement V8 engine from GMC, a 5.3 liter mill producing 355 horsepower. This truck, with this engine earns a better EPA estimated mileage than any other V8 or turbocharged V6 engine in the truck market. It is capable of 23 mpg highway in 2WD versions. One reason that the new Denali is able to achieve this amazing fuel economy is aerodynamics. Attention to detail and continuous study by GMC has resulted in a truck that has an excellent coefficient of drag for such a large boxy vehicle. Our recent story explained a lot about how the new truck cuts through the wind, dismissing many urban myths about aerodynamics in trucks. GMC also uses expensive materials in the body of its trucks to reduce weight and increase strength. This results in a better product that also uses less fuel. 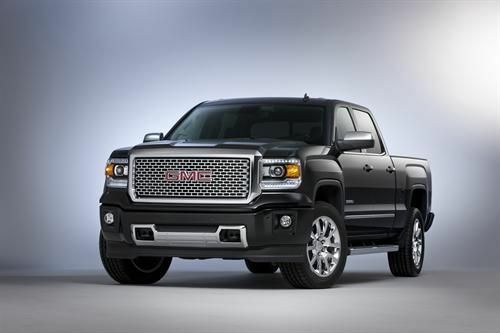 The 2014 GMC Sierra Denali is defined by its luxury compared to other models. Like the Chevy Silverado King Ranch, it is meant to win customers who might have considered a Ford F-150 King Ranch. This starts outside with a chrome grill, polished 20 inch wheels, and stainless exhaust tips. For those who don’t want a truck completely covered in chrome the Denali offers a nice departure from that trend with body-colored bumpers. There will be a Z71 off-road package available for 4WD Sierra Denalis. The safety package includes Forward Collision Alert, Driver Alert, and Lane Departure Warning. The new GMC Safety Seat we previously detailed will also be part of that package. Stand-alone options include the larger, 6.2 liter engine, rear seat entertainment, and sunroof. Look for the new 2014 GMC Sierra Denali in dealerships this fall.